1) Would you want to live forever? Why or why not? What does the book say about our society, that the obsession with eternal youth proves our downfall? 2) Are you the kind of person who flees from civilization, or one who thinks the city is safer? Why? 3) How did you first die? Share your experiences with the group. 4) Did you make it all the way to the end? Talk about your path to survival. 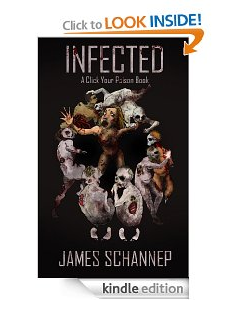 5) There are certain expected norms in zombie fiction. To what extent did INFECTED uphold these traditions? What might have Schannep added to the genre? 6) Once you’ve progressed far enough, you may have noticed that no good can come from traveling alone. What do you think the author was trying to say here? 8) It appears that each of the survivors we meet have some kind of emotional baggage. What, if any, significance does this carry? What does it say about the human spirit? 9) In what ways does a cure change the social mores of a post-apocalyptic zombie world? 10) How did you feel about being “in control” of the story? Did you feel more or less involved than you do with traditional books? What about the influence of videogames? 12) What are the possibilities of a real zombie apocalypse? Do you think the book could serve as a cautionary tale, or is it mere entertainment?